Cast from real branches, Nancy Nelson's piece reminds you to keep a childlike curiosity for nature. Do you remember the childlike enchantment of collecting souvenirs—rocks, twigs, flowers—as you frolicked around outside? Designer Nancy Nelson helps keep that sentiment alive with her one-of-a-kind necklace. Each brass pendant is cast from small branches found outside her West Virginia studio. 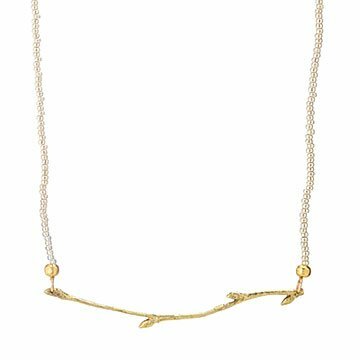 Shen then strings a row of silver "seed" beads onto a 14-karat gold-plated chain. The design travels from Nancy's nature-filled studio to your loved one, whether they're an outdoor enthusiast or just keep that innocent curiosity. Handmade in Maryland.